These photos taken by Cromer publishers Poppyland Publishing at the beginning of April 1981 show some distinct differences from the 2001 set and from the buildings we know in the town in 2010. 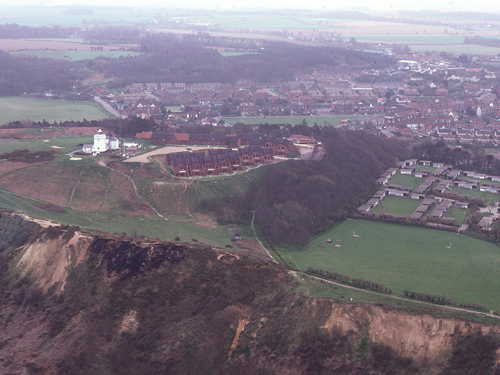 For instance, the last vestiges of the Metropole Hotel stand on the clifftop to the north of the Church. One of the grand and imposing hotels from the Victorian era, it did not come back into use after the Second World War and was left in a state of partical demolition for some time. On the promenade below stands the Cedar Wood caf�, which operated as such for a time; intially the building had been used for a model railway exhibition. On the west promeade, below the Melbourne slope, stands the 'igloo' that was the base for the inshore lifeboat for a number of years. In front of the Red Lion steps is the Victorian toilet block, surely a more appropriate design that the bland brick structure that replaced it - which is itself looking for a new use in 2010. In town the car parking area on the Meadow is considerably smaller than it is today. I wonder if when R.W.Clarke gave the Meadow to the town he ensivaged the gradual encroachment of the cars - but then perhaps they're just our equivalent of the horses that were once there, as illustrated in the book. There's more detail and links to other aerial photograph sources on the 'From the Air 2001' page.